I love standing in front of the jellyfish tanks at zoos and aquariums. It’s usually in a very dimly light room. Watching them all swim around in slow motion is very soothing. Nature’s lava lamp. Today’s Maximumble fights it out. As a non-American, I had to check the comments. Glad I did, good gag. Oh interesting. It never occurred to me that peanut butter & jelly sandwiches were that regional. I remember that I was told by a child about jellyfish jelly. I didn’t have the heart to break his illusion! This is one of the only ones in recent memory where I didn’t get the joke until looking at your description below it. Well played, good sir! If you ever get to an authentic Chinese restaurant, ask for jellyfish. It’s surprisingly awesome! Has the consistency of noodles (it’s made from the bell not the tentacles though) but a little tougher. Is it unusual in some way that I’ve never eaten a peanut butter jelly sandwich? I think it seems like a weird combination, but maybe that’s just because peanut butter isn’t that common in Sweden, where I live. Peanut butter is unusual here? o.O I never knew. I would’ve thought jelly was unusual here, not peanut butter. ^^’ We usually have at least one jar of peanut butter and one jar of jam at home, jelly is rarely seen. But we don’t eat the peanut butter and the jam together. Maybe it’s just our habits. I mean, we do have halva at home at all times but I’ve never met anyone who knows what I’m talking about. o.o Yes, I make sure they know I’m not talking about the word for “half”. I even say helva to make it sound less confusing. I didn’t know until maybe just a few years ago that you can buy peanut butter in Sweden… And by the way, what is “halva”? I have never heard of it before! It is weird, I admit. x’) It’s made out of sesame seeds or sesame seed oil, can’t remember which. Usually it supposed to taste like vanilla (although, I don’t think it does) and has pistachios or cocoa mixed into it. Google “helva” if you want to see some pictures, it looks rather weird and tastes rather weird but it’s really enjoyable. ^^ It’s used either on sandwiches as some sort of spreading or as candy, but I recommend only eating small portions at a time since it’s so sweet. Maybe Biff shold try the zoo? I hear they have Honey Badgers there. 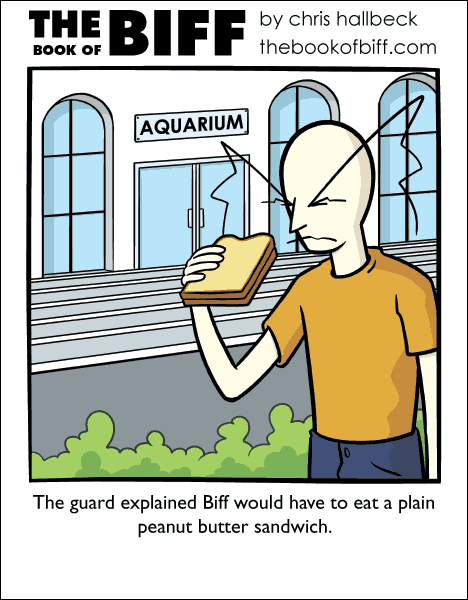 Maybe Biff should try the zoo? I hear they have Honey Badgers there. Beats me. And Honey Badger don’t give a damn either. Maybe he should make a trip to Jellystone National Park. Oh, wow. I didn’t get that until I checked the comments. That’s definitely regional thing. I live near an aquarium with an octopus in it. whenever I go to the aquarium I always visit that octopus. He’s a pretty cool guy.